The M755CU is a nice improvement upon the M754WG. The ABZORB® Strobel board along with the ABZORB® FL gives this shoe a very soft and comfortable ride. New Balance lightened the shoe by 7/10 of an ounce over its predecessor and also added the Lightning Dry™ Collar and N-LOCK™ Midfoot Support. The M755CU is fitting similar to the M754WG (true to size). I’ve also noticed the effects of the Lightning Dry™ Collar as this shoe seems to dry quickly; although, the true test would be a run on a nice hot summer day in St. Louis! The ABZORB® Strobel board along with the ABZORB® FL gives extra cushioning and shock dispersion. The N-Lock™ Midfoot Support gives a snugger fit through the arch area which helps to support the arch through the running gait cycle. The Lightning Dry Collar dissipates moisture which helps to keep the foot dry. 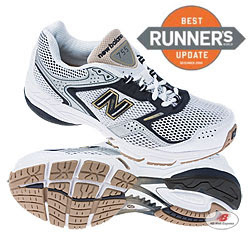 Tom recommends the 755 for the neutral runner looking for a well-cushioned running shoe. The 755 packs excellent comfort, adequate motion control and support. In terms of cost, the 755 is an excellent value priced at $84.99 on NBwebexpress.com and provides an excellent ride. Overall, Tom rates the 755: 17-26.2 Miles (Best)Look for other reviews on the NBwebexpress.com Blog!Coming Soon...the New Balance 767!